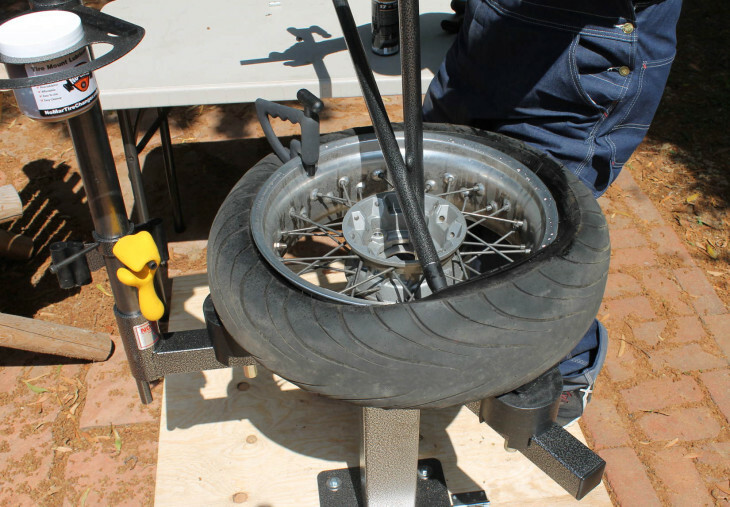 Patented mount/demount bar and XtraHand clamp make quick work of tire removal. My tire-changing technique has long consisted of a mix of swearing, sweating, and frustration. Sure, there was equipment too—but I never got to the point where I was fast and happy changing tires. I started with a simple tire-changing stand, like the motocross guys use. I changed some tires with it, swore a lot, modified the stand to make it easier to work with, swore some more, and moved on. Next up was a tire changer from that cheap tool store—you know the one. I’d seen stories on the Internet, claiming that with some simple modifications, the thing was great. Not so. It was better than the tire stand, but I hated this flimsy contraption so much that the online classified ad I posted to get it out of my garage included the line, “I hate this thing. If you’re looking to get pissed off enough to buy something better, I recommend you buy this changer from me and do a few tires with it.” Surprisingly, someone bought it, and I assume is now cursing me for selling it to him and shopping for a real tire changer. At that point, I did what I always do when I run into problems caused by my own lack of skills and patience—I got better tools in hopes of overcoming my incompetence. I’d been keeping an eye out for a used No-Mar tire changer, but they rarely pop up and always sell instantly. So I took advantage of a springtime sale at the No-Mar website and got myself a No-Mar Classic tire changer. The videos on their site make changing tires look as easy as pizza pie, so I dialed them up and handed over my credit card number, certain that my days of swearing and scratching wheels would soon be over. The Classic tire changer is a “commercial grade” tire changer that uses No-Mar’s cam and block system to grip the wheel, and their patented Mount/Demout bar to remove and install tires. It can be mounted on the floor, your trailer hitch, or on a “drive-on” stand. I got the basic package ($645) which includes the changer, bar and accessories like tire lube paste, a Yellow Thing (to prevent bead creep when changing tires), a spare demount tip and an instructional DVD. I also ordered an XtraHand clamp and a tool collar so I could keep lube and tools close at hand on the changer. Assembly is pretty straightforward—I was ready to change tires in about an hour, and I was taking pictures along the way. So is it really that easy to change tires with this thing? Pretty much—but there are a few caveats. Most importantly, you have to get the technique right. Once you do, changing tires is so easy you’ll be inviting your pals over to change their tires at your place, just for fun—as long as they’re street tires on modern wheels. Do it wrong, and you’ll be just as red-faced and angry as you were before. Narrow and deep rims will still require spoons—the mount/demount bar can’t work with these types of rims. Knobbies (or “knobblies” for Redcoat ADV riders) will also require spoons, and are tough to grip with the default cam and block setup of the Classic. No-Mar makes an alternate “Posi-Block” setup for gripping knobbies and big cruiser tires that is available separately. I didn’t buy it when I ordered my changer, but probably will. Ducati 900SS: typical tubeless sportbike wheels. Super easy. BMW R1200R Classic: spoked wheels, originally tubed, now converted to tubeless. Incredibly easy. Seriously—at this point, the skies opened up and a choir of angels sang to me. Early seventies Moto Guzzi V7 Sport—deep, narrow, beautiful aluminum wheels that simply could not be scratched. The mount/demount bar wouldn’t work with these wheels, so I used the No-Mar to clamp the wheels and carefully did the tires with spoons and rim guards. Still easier than any previous setup due to the stability of the No-Mar. Yamaha TTR125: narrow spoked wheels with tubes. I had a tough time gripping these wheels with the cam and block setup, and of course had to use spoons instead of the mount/demount bar. Most importantly, it really is incredibly easy to change tires with the No-Mar Classic, once you get the technique right. The cam and block system grips most wheels very well, and the mount/demount makes quick work of removing and installing street tires. The XtraHand clamp is amazing: easy to get in place quickly with one hand, and does a fabulous job of holding the bead below the rim flange. Solid, tough construction. Unlike other tire changers I’ve used, this thing is built to last and doesn’t flex. Serious business! The tool collar is not as burly as the rest of the equipment. No-Mar says you can hang a mount/demount bar on the collar, and while that’s technically true, the collar bends with that much weight on it. I wouldn’t recommend hanging the bar on the collar for any length of time. Additional clamps to clamp knobby tires cost another $150. To be fair, you can order the changer with Posi-Blocks instead, but I wanted the cam and block setup since I mostly do street tires. That isn’t going to stop me from whining about this, though. …And the Total Marketing B.S. This almost never happens, but there’s really no B.S. here. 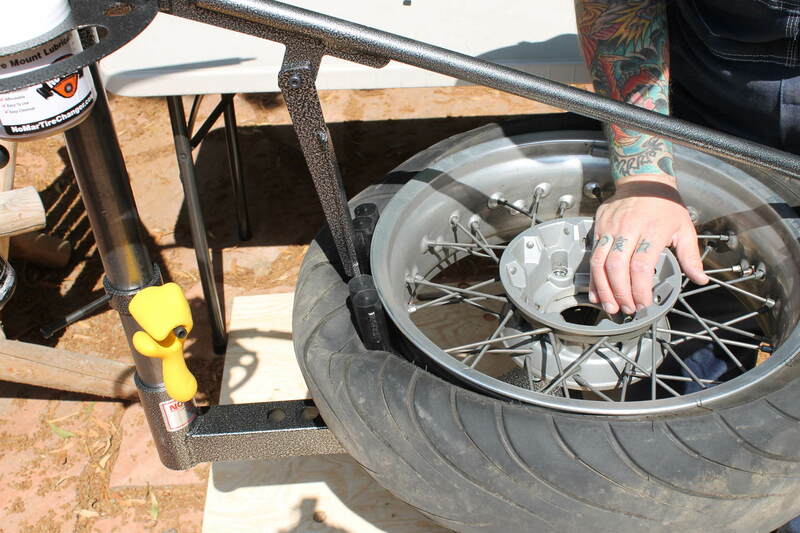 The Classic is a kickass, American-Made tire changer that will make you feel like a pro. The No-Mar Classic isn’t cheap, but if you ride a lot and therefore go through tires quickly, you’ll break even after a few changes and you’ll get the satisfaction that comes with boasting that you do your own tires. For me, it’s equally important to be able to quickly and easily change my own tires at home at any time, rather than finding a time to get my bike to a shop. This thing rocks: it’s a thoughtful, smart design with first-rate construction, and most importantly, it fulfills the promise of making tire changes easy. No scratches on these beautiful old Guzzi wheels! The NoMar is a staple of our bike-nights. I got it 6 years ago when we were doing a lot of track days. I think we’ve changed well over 100 tires on it and the only hard part is remembering how to get started in the spring (I’m in upstate NY. Well Matt I must say that is part of my desire to get my own changer. Starting a business for my friends and having a fun place to hang out and get ahem “stuff” done is the goal. I’m just trying to decide between the Jr. Pro and the Pro….yes I’m a bit of an overkill type! I have been changing my own tires for at least 30 years. Have had the harbor freight set up for a long time. I do use a lot of the No Mar tools. When I use tire irons, for rim protection, I use cut out sides of laundry detergent bottles. The plastic is thick, and slides out easy. Besides I seem to never run out of supply. You can build a bead breaker with some 2X4, some 1X4, and a hinge. Some more 2X4 will build a floor box to lay the tire on. Once the bead is broken you can put the wheel on a pair of saw horses. 3 good spoons and some lube and the tire will come off pretty easily as long as you are sure to keep the bead pressed down into the well of the wheel everywhere but where the spoons are. Tubeless tire are a piece of cake, but narrow tube tires are kind of a pain, especially if there are rim locks involved. On some bikes getting the wheels on and off is a bigger pain than changing the tires. A tire machine would be nice if I changed a tire a week, but at my rate of a tire every 2-3 months, it’s hardly worth it. BTW Old, cheap tires are always harder to mount/dismount than new high quality tires. 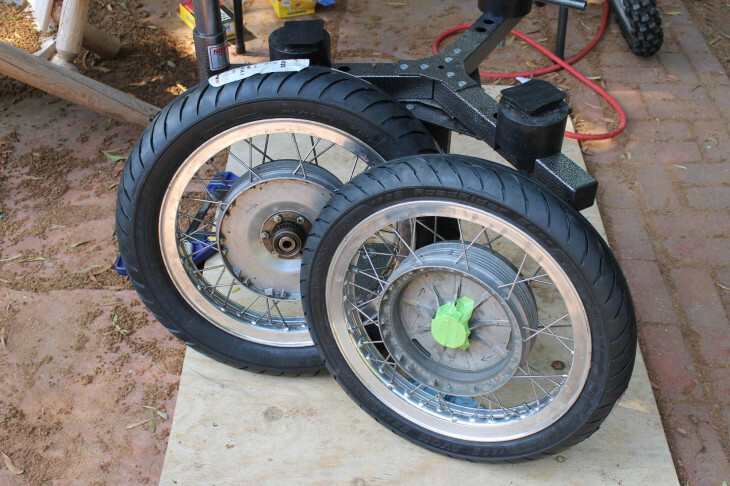 I have done a few tires like this, but I had a harder time with the wheels on the sawhorses. Once I put them on the floor with 2×4’s underneath, I gained a lot more leverage by kneeling on the tires as needed. Harder on the back and knees, but easier working with the tires. Big, professional style tools are always nicer and easier, but it does come down to cost, space, and how often you use it.. I do have a wheel balancing stand that makes life easier, not that big or expensive… If I had the room, I probably would get this mounting tool, then charge my friends a few beers to get their tires changed! Cool and all but I change mine on the floor (2×4’s keep rotors off concrete) with 3 levers and a jug of lube in about 30 min. Can’t see spending $500-1000 on this unless I was doing it weekly at least. Plus you have to store it. You have my respect. I can change tires with “spoons” but it ain’t pretty, involves a great deal of sweat and more than 30 minutes. Not to mention a good chance of scratches on the wheels. I made a huge mistake many years ago, I spent time I should have spent learning motorcycle skills in school and working stupid hours in Silicon Valley. I used to pay people to work on my bikes. Now that I have time and really enjoy working on my bikes I’m learning stuff I should have learned 30 years ago. The Cycle Hill allowed a much shorter learning curve and less damage to my bikes while I was learning. I’m not saying you can’t hurt a wheel with a No-Mar product but it would take some effort or really bad luck. I’ve found scratching wheels with tire irons is not hard at all. This is the kind of thing I was asking for when you did the article about using a phone on a motorcycle. Really good stuff, thanks. I used the Classic a lot when a friend bought one, I bought the cheaper No-Mar Cycle Hill version when he left the area. Having used both I’m happy with the Cycle Hill. The Classic is clearly faster, if I mounted lots of tires I’d have bought the Classic but I only do 10 to 15 a year between my bikes and a few friends so 5 minutes or so per tire isn’t a big deal to me. Besides saving money my big reason for buying the tire changer is working to my schedule. The closest place to my house that will change tires is about 12 miles away and isn’t open 24/7. My Cycle Hill is in my garage and is open 24/7. If I find new tires delivered Tuesday after work I might just mount them Tuesday after dinner. My tire changer is about equal to my (also US made) Handy Sport bike lift as pricey indulgences I enjoy enough to forget the cost. PS You forgot one very important point: Wear old clothes when you mount tires. It is not a clean activity. Thanks Goose. I’ve heard a lot of good things about the Cycle Hill as well, but went with the Classic for a bunch of reasons, one being that I just wanted a heavier-duty rig. So at around 700 bucks, The place I take it to (ROADRIDER)charges 15 bucks to install 2 dollars for tire disposal. It would take me 41.2 tire installs to get my moneys worth if you only include just the service. I would never include the cost of tires and install and compare it with the cost of the tire changer. You’re lucky to have a place that will do them that cheap. Where I live the going rate is between $90 and $100 to change two tires and that’s if you bring the tires to the dealership already removed from the bike. It wouldn’t take very long at all for me to get my money back out of a quality tire changer. Cycle Gear will do it for $30 a pop. Yeah, local shops ’round me charge 40-50 each if I bring in my wheels and don’t balance them either. My BMW needed larger cones. Plus they would scratch the hell out of the rims. So I invested in the No-Mar Classic and balancer. Paid for itself in 1 year as I had 5 bike at the time and went through 10 sets a year. Best money I’ve spent and have had it 8 years now. I also have the Posi-Blocks for my dirt bike these days. A great addition. I use these for the HD also. Holy criminey. You must be riding at least a hundred thousand miles a year! Unless you’re doing track days every weekend. Very well written article Surj. Fantastic to see the Guzzi wheels on the net! I would agree it is a well made product and for the spoked wheels and dirt tires the Posi-Clamps would be much better suited. Thank you for having me down and swapping a few tires. For those asking, the Guzzi wheels were balanced with a home made static balancer. Thanks Sam! It was a treat just to be able to get a look at those sweet old Guzzi wheels. Parnes balancers work great. They allow for a high degree of accuracy…as I can usually cut 7g. weights in 1/2 to get uber balanced. There are some common stories in motorcycling where the veterans knowingly shake there head,nod and chuckle. Tire changing seems to be in that group of events similar to zero speed tip overs, riding in gawd awful conditions or stripping a bolt. All painful events you wish you could reverse time and go back and make a choice to something completely different. Ya that’s my view of changing tires. Let me tell you about changing my winter studded tires on my EXC. Ah good times! I’ve got the same No-Mar Classic model and it’s been great. I got the hitch mount and used to take it to work to help out the other bikers there. As for balancing, I use the Harbor Freight Item #98488 motorcycle tire balancer. I bought a better balancer shaft and cones from No-Mar, but found that the stock HF ones worked well, too. I did a lot of tires for me and for friends and it worked great (I know that others reported quality issues with theirs, but mine had no problems). Far stronger for removing stubborn tires (heavy cruiser tires, car tires, Gold Wing tires). Unlike the No-Mar item, this has a high-strength 3/8″ steel bolt going through the center of the nylon demount end. Mounting is far easier (for me), than using the No-Mar mount/demount bar. For most tires, I demount with the No-Mar and mount with the Mojolever. I have the hitch mount too. The SUV ain’t moving and I don’t have to store a sheet of plywood either. And I didn’t want to put the included mounts in my garage floor. Not like I had room to use it in there. I’ve bent a lot of demount tips by No Mar. The HDs and my friends’ cruisers are hell on them and we end up using the No-Mar pry bars anyway. Street tires, fine, but not the cruisers. I need to look at the Mojo. I am using the plywood sheet for now, until I decide where I want to mount the No-Mar. I had the previous setup bolted down in the garage when I was using it, and down in the basement when I wasn’t—better use of the space as I send to have a constant parade of bikes in and out of my tiny garage. The No-Mar may end up mounted permanently in the basement, but in the meantime, the plywood you see is actually split in the middle, with hinges. I cut handles into the ends, and I just fold it up when not using the No-Mar. The two bolts on each side stiffen it up and give me a platform to stand on—works great until I figure out where I want to put it permanently. The basement is huge, so tossing the folded up plywood down there is no biggie. I’ve got a no mar. It’s really fun to be able to do this easily, for yourself and friends! It goes easiest for me, if I let the new tires heat up in the sun, while I’m removing the old ones. What do you use to balance them? Hey Hair. I use a Marc Parnes balancer—I have a bunch of the adapters for various bikes. Marc makes great stuff and has been super helpful when I’ve emailed him. I’d just use Dynabeads (or similar) to balance. The work very well indeed…and the best part? They are re-usueable over and over. Let’s ask motorcycle daily to test bead and liquid “balance systems” preferably with some scientific, engineering and seat of the pants judgement levels. Maybe a double blind study with riders and bikes balanced different ways and the riders submit their opinions and judgements of the effectiveness of each balance. Thanks Bartman. I use a Marc Parnes balancer—I’ve collected a bunch adapters for various bikes over the last couple years or so.